Good vision develops early in life. A newborn’s vision develops rapidly during the first year. Therefore, early detection of childhood eye diseases and problems is critical so that the risk of permanent visual impairment is minimized. Vision develops fully in children with little or no special attention. Although eye problems are rare, the majority can be treated if detected at an early age. Children’s eye exams at proper age intervals are the key to maintaining your child’s healthy vision. The earlier the visual problems are detected, the better the outcome. Virginia Eye Institute physicians partner with pediatricians, family physicians, and school nurses to ensure that when eye problems are detected WE pediatric specialists are able to further evaluate and treat the condition. If your baby can’t make steady eye contact by 2-3 months of age, or seems unable to see, you should consult your pediatrician and ask for a referral to the pediatric ophthalmologists at Virginia Eye Institute. A constant crossing or out-turning of the eyes (sometimes called a “lazy” eye) is usually abnormal; though most babies do occasionally cross their eyes during their first 3 months of life. Babies older than 3 months of age can usually follow or “track” an object with their eyes as it moves from place to place. There are many eye conditions and diseases that can affect a child’s vision. Some of the more common focus and alignment disorders and eye diseases are listed below. Early diagnosis and treatment are critical to maintaining your child’s eye health. If any of the following conditions is suspected, the child will need to be examined by a pediatric ophthalmologist. Amblyopia is a term used to mean poor vision in an eye that has not developed normal sight (usually during early childhood). The condition is sometimes called “lazy eye.” It occurs when visual acuity is much better in one eye than the other. Amblyopia is common and affects two or three of every 100 people in the U.S.
Amblyopia can be a result of strabismus (misaligned eyes). One eye may look straight ahead while the other turns in, out, up or down. The eye turn may be constant or may be occasional or intermittent. Signals from the misaligned eye are “turned off” by the brain to avoid double vision, so the child uses only the better-seeing eye. Strabismus affects about 4 percent of children in the U.S. Amblyopia can result from eye problems other than strabismus as well. If it seems that the vision in one of the child’s eyes is significantly better (or weaker) than the other, the child needs to be examined by an Eye M.D. (ophthalmologist). If the surface of the eye, which is normally clear, instead appears cloudy, the child may have a cataract or childhood eye disorder that needs treatment. Ptosis involves a drooping upper eyelid that covers the eye either somewhat or entirely, and so blocks vision. When the following diseases are suspected, the child needs to be examined by a primary care physician or children’s health service, who will co-manage the child’s care with an ophthalmologist when necessary. Conjunctivitis can refer to either a viral or bacterial infection (both very contagious), or an allergic reaction (not contagious). The eye appears red or pink due to inflammation of the conjunctiva, the thin, filmy membrane that covers the inside of eyelids and white part of eye. The eye tears and/or has discharge, and is usually itchy and uncomfortable. When a viral infection is the cause, the child may also have a fever, sore throat and runny nose. If the child has (or may have) contagious pink eye, he or she needs to stay home from school or return home to avoid infecting others. Contagious pink eye usually resolves in three to seven days. When the tearing and discharge from the eyes has stopped the child may return to school. Chalazion looks like a small lump on the eyelid, and may occur when a meibomian gland (an oil-secreting gland in the eyelid) becomes clogged. It is not caused by infection. A stye looks like a red, sore lump near the edge of the eyelid; it is caused by an infected eyelash follicle. Cellulitis is an infection related to trauma, an upper respiratory infection or an eyelid infection. The tissues around the eye appear red and painfully swollen. The condition usually occurs in one eye, which may be swollen shut. More serious preceptal or orbital cellulitis infections can cause decreased vision, an inability to move the eye, and the appearance of the eye being pushed forward. Both forms of cellulitis are serious conditions that require urgent medical attention. Take the child to a primary care doctor or other qualified health professional who will co-manage the child’s treatment with an ophthalmologist. When children participate in sports, recreation, crafts or home projects, it’s important for them to know eye safety practices and use protective glasses as appropriate. Each year thousands of children sustain eye damage or even blindness from accidents at home, at play or in the car. More than 90 percent of all eye injuries can be prevented through use of suitable protective eyewear. Sports deserve particular attention, because eye injuries occur fairly often in children and young adult athletes: between the ages of five and 14, most sports-related injuries in the U.S. occur while playing baseball. 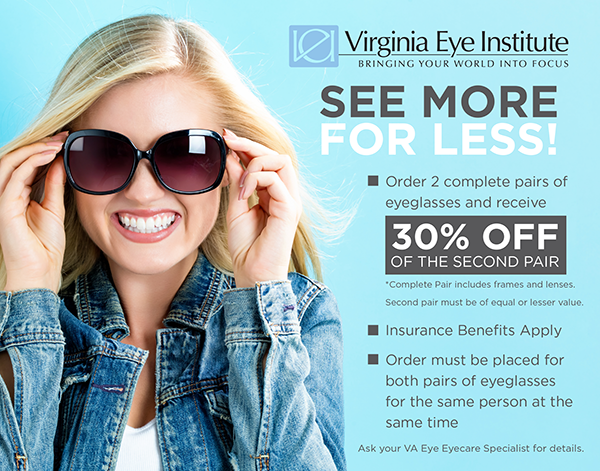 Virginia Eye Institute optical shops offer a full range of rec-specs. Children should wear sports eye protectors made with polycarbonate lenses for baseball, basketball, football, racquet sports, soccer, hockey, lacrosse, and paintball. All chemicals and sprays must be kept out of reach of small children. Parents and others who provide care and supervision for children need to practice safe use of common items that can cause serious eye injury, such as paper clips, pencils, scissors, bungee cords, wire coat hangers and rubber bands. Model eye health by safeguarding your own sight with ANSI-approved protective eyewear during potentially dangerous yard work and household repairs or projects. Avoid projectile toys such as darts, bows and arrows, and missile-firing toys. Look for toys marked with “ASTM”, which means the product meets the national safety standards set by the American Society for Testing and Materials. Use safety gates at the top and bottom of stairs. Pad or cushion sharp corners. Put locks on all cabinets and drawers that kids can reach. Do not allow your children to play with non-powder rifles, pellet guns or BB guns. They are extremely dangerous and have been reclassified as firearms and removed from toy departments. When very small children (age 4 and younger) are bitten by dogs, eye injuries occur about 15 percent of the time. The dog is usually one the child is familiar with, and second attacks by the same dog are likely to cause more serious injury. It is recommended that any dog that bites a child be removed from the household. On the road, make sure children are properly secured in baby carriers and child safety seats and that the seat and shoulder belts fit well. Children age 12 and younger should never ride in the front seat. Store loose items in the trunk or secured on the floor, as any loose object can become a dangerous projectile in a crash. An ophthalmologist, primary care doctor, school nurse or children’s health service should examine the eye as soon as possible, even if the injury seems minor at first, as a serious injury is not always immediately obvious. Delaying medical attention can cause the damaged areas to worsen and could result in permanent vision loss or blindness. DO NOT try to remove any object stuck in the eye. For small debris, lift eye lid and ask child to blink rapidly to see if tears will flush out the particle. If not, close the eye and seek treatment. Only in the event of chemical exposure, flush with plenty of water. Why is regular vision screening so important, especially for children? Good vision is key to a child’s physical development, success in school and overall well-being. The vision system is not fully formed in babies and young children, and equal input from both eyes is necessary for the brain’s vision centers to develop normally. If a young child’s eyes cannot send clear images to the brain, his or her vision may become limited in ways that cannot be corrected later in life. But if problems are detected early, it is usually possible to treat them effectively.